In this video produced by Jordan Flaherty and Lily Keber we are shown one side of the Gaza problem here described by the filmmakers: "After 3 years under siege and a recent Israeli-led offensive, Gaza continues to suffer. No materials for rebuilding are allowed in, and education and industry continue to be stifled. Shot in June 2009, this short film gives a glimpse into the harsh realities of everyday Gaza under siege." We are told that there are billions of dollars in reconstruction money pledged and waiting to be used to buy cement, tools, and construction equipment but that Israel will not allow them in. What is missing in this film is the reason why reconstruction has been delayed so far: Hamas will not allow it. Israel says it will allow construction supplies and moneys to flow in freely if Hamas is not involved in their distribution. That's right, if Hamas had any compassion or interest in the plight of Gazans, they would step back and allow the reconstruction to begin, see al Jazeera video report. The refusal of Hamas to allow the Palestinian Authority to supervise the reconstruction is easy to understand: Hamas does not want actual reconstruction to take place. They have no interest in rebuilding hospitals, schools, or apartment buildings. What they want is to build underground vaults for storing weapons and other military supplies and tunnels for their transportation and to hide those facilities by building hospitals, schools, or apartment buildings over them. While Israel builds hospitals with underground bunkers for the protection of civilians, Hamas builds bunkers for the storage of weapons and the protection of terrorists (1). The refusal of Israel to allow Hamas to supervise the reconstruction is so obvious it boggles the mind why UN agencies involved in the Gaza reconstruction are blind to it. We also hear that the land is bulldozed by the Israeli military. I do not recall reading about German or Japanese land being bulldozed by American forces during decades of occupation. Now why would Israel do that? Again, what is omitted is the why. The fact is Israel bulldozes homes when terror tunnels are hidden underneath them (2). We hear that the children of Gaza are suffering from malnutrition; yet even the Israel-bashing UN aid agencies admit that Israel permits food and humanitarian supplies to enter Gaza. Why aren't the children receiving the food supplies? Could it be that Hamas sells the food so that it could buy more explosives? And by the way, how come Hamas can bring in tons of missiles and bullets through its tunnel systems from Egypt yet cannot bring in one ounce of food or medical supplies? How come? The people of Gaza are suffering? Hamas can fix that: recognize Israel, respect previous peace accords, and renounce violence. Do that and Israel will open the borders. Do that and reconstruction can begin. Do that and the humanitarian crisis created by Hamas can end. Here is something you would not see Hamas building: Ichilov hospital, located in Tel Aviv, builds an underground facility, which would protect its staff and patients from rocket and missile attack, as well as from unconventional attacks. In contrast, in Gaza, Hamas allegedly used the underground facilities in Shifa hospital to hide its leaders, as they believed – and rightly so – that Israel would not attack the hospital. It is important to understand that while the world criticizes Israel for causing high amount of casualties in Gaza, the reason for most civilian casualties is the lack of infrastructure to protect civilians in case of a bombing – something every Israel neighborhood, every town, and every city has. 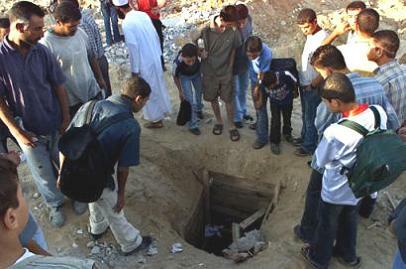 The sole reason for low amount of Israeli casualties is the bunkers built everywhere – especially in the South – which protect the civilians in case of rocket attacks (Sderot citizens have fifteen seconds to run to a nearby shelter in case of Qassam rocket attack). Hamas never erected such facilities for its civilians, using the monies provided to it for purchase of firearms and explosives instead. The smuggling business began in Rafah during the 1980's, due to the city's economic condition and geographic location. The smuggling is carried out mainly through tunnels dug under the border - while in the past smuggling took place overland as well. Parallel to the smuggling industry in the area, the extremist Islamic infrastructure also developed, which increased the involvement of the residents in terrorist and smuggling activity. The economic element comprises an important factor in channeling local residents and families into the weapons and ammunition smuggling industry. During this period, a large-scale smuggling industry developed in Rafah. This industry comprises a primary source of income for entire families, and is the main source of income in the area. Due to the lucrative economic aspects of this industry, a power struggle has been raging between different clans and tribes over control of the smuggling. The method of tunnel construction is complex and has evolved numerous times throughout the years. Currently, the construction of tunnels is overseen by Palestinian residents of Rafah who have specialized in this area over the years. The smugglers in Rafah are now experts in digging tunnels and smuggling weapons. The smugglers participate in this activity in all its aspects. The smugglers transport weapons for terrorist organizations, or for other elements who order firearms in exchange for money, and transfer money to Palestinians and Egyptians who own the house or land while the tunnel is dug. These people are adapt at how to avoid detection of the tunnels, thus they build them in residential areas and use small children to construct the tunnels and smuggle the weapons. 1) Locate a landowner who agrees to provide his house for the exit of a tunnel. 2) Search for a suitable opening for the tunnel on the Egyptian side. The tunnel opening should be located in a house or within private property, to: allow the owner of the house to cross from one side to the other; to keep in accordance with agreements reached with Egyptian officials; for economic reasons, and to prevent discovery of the tunnel by Egyptian officials. 3) Choosing an engineer: An engineer who specializes in the excavations of tunnels is chosen. The engineer mobilizes and recruits individuals to construct the tunnel, and provides electric and hand-held tools for the job. 1. Secrecy: Ensure that the building area of the tunnel construction remains secret. Do not allow members of any other family or clan to discover the tunnel. 2. Work at night: To guarantee that the tunnel is not discovered, and to conceal excavation activity from the IDF. 3. Transporting tunnel material: Transport the sand (from the excavation activity) away from the site in a vehicle.